After attempting to read Kant's Critique and the Prolegomena, after banging my head against the wall repeatedly, I figured it was time to break down Kant's terms into something manageable. First, a few notes from the introduction to the Critique of Pure Reason: Kant is concerned with securing a foundations for science and metaphysics. Being awoken from a dogmatic slumber by Hume, Kant explores the distinction between empirical (sense/experience) knowledge and rational knowledge (logical/known before sense/a priori). My hope is to develop a thorough, workable map of Kant's view of human understanding. How does man come about knowledge? What steps are taken from sense data to concepts and judgement? Below are a few of Kant's quotes (indented) with my attempt at commentary/summation/paraphrase, and also the beginnings of a glossary in which the terms themselves are colored red and are followed by quotes and additional attempts at summary in italics. The translation used is Jonathan Bennet's Early Modern Texts. Sensibility gives us objects and this process creates intuitions. Understanding, through which objects can be thought, gives us concepts. All thought must relate back to intuitions and thus to sensibility. When an object affects us, its effect on our capacity for representation is •sensation. An intuition that is related to its object through sensation is called ‘empirical’. Anything that an empirical intuition is an intuition of—whatever the details—is called an ‘appearance’. The element in an appearance that corresponds to sensation is what I call the ‘matter’ of the appearance; and that which allows the manifold of appearance to have a certain ordered and interrelated pattern is what I call ‘form’ of appearance. This form of appearance ·isn’t a product of the matter·; the •form, which is required for the sensations to be ordered and patterned, can’t itself be another sensation! So it must lie in the mind a priori, ready and waiting for sensations ·to come and be shaped up by it·; so it can be considered separately from all sensation. All the •matter of appearance is of course given to us only a posteriori. (34) Sensed intuitions (building blocks of experience) are called appearances. Kant uses a juxtaposition as old as the Greeks to divide the appearances into the 'matter' (the sense data) and the 'form' (the structure). The form comes from our minds ordering power; it itself is not another appearance. Our minds come equipped with the ability to organize the sense data they receive. 1. Sense data comes into the mind (already?) organized by space (external) and time (internal). 2. The 'pulling together' of these bits of sensory data is performed by an active ability for representation. In summary, the history of philosophy generally places Kant in the position of synthesizing the views of rationalists--those who believed human understanding used deductive, intuitive logic--and the empiricists--those who believed all human understanding comes from the senses. Kant's move was to argue that the human mind imposes an order (rationalizes) upon the sensory data (empirical data) of the world. The mind does this by ordering the world through the imposition of the 'pure intuitions' of space and time. 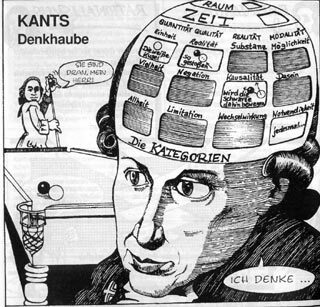 Once information is so ordered, it can be processed by Kant's quite famous categories of understanding. The process is, as the final excerpt form Kant outlines, one of receiving sensory data (a passive sensibility) and one of ordering this data so that it can be used and understood (an active understanding). This means that humans are blocked off from transcendental (in the traditional sense) knowledge of the world; one cannot know the object as it exists (noumena), but can only know the mind's processed representation of the object (phenomena). Next is to systematically outline the exact steps in this process of coming to knowledge. As the Stanford Encyclopedia of Philosophy suggests, part of the problem of simplifying Kant's system of knowledge creation--besides the confusing terminology--is that many of the processes overlap, some are inseparable, and some are only explained in a 'shadowy' way. And then on to my "real" question, the one that got me on this train: how can Pirsig have an a priori motorcycle?